Pipestone Music Days Weekend promises to be another showcase of our local musical talent. 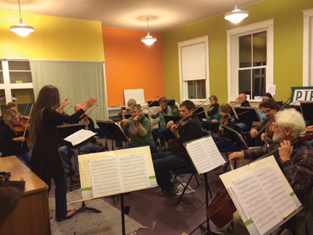 Conducted by Tara Kaiyala Weaver since 2012, the Pipestone Orchestra performs Saturday evening, May 23 at 7pm in the Methow Valley Community Center Gym and will feature music by Mahler, Dvorak, Mozart and Beethoven, along with other special surprises of the evening. True to Cascadia’s mission of providing educational as well as performance opportunities for musicians of all ages and instruments, several will be featured as soloists with the orchestra including Matt Armbrust, violin, and David Konigsmark, French Horn. Pipestone Music Days continues with student recitals on Sunday, May 24. Beginning at 1pm, students will perform solos and small ensembles on guitar, piano, violin, viola and cello. Teachers at the Pipestone School of Music are proud of the hard work and dedication each student has put in this year. Co-founders Pam and Terry Hunt feel that along with diligent practice, the encouragement of the valley’s growing musical community has contributed to the remarkable progress of the students this year. For further information regarding Pipestone School of Music, events or private lessons, call 509.997.0222. Pipestone School of Music is the educational branch of Cascadia. DATE: May 23, 7pm and May 24, 1pm. LOCATION: Methow Valley Community Center, Twisp. CONTACT: Cascadia, 509.997.0222.